With the recent explosion of fascination with Tibet and Tibetan culture, Tibetan medicine is receiving greater attention from the public, scholars and the media. As with many aspects of Tibetan culture, significant and complex issues determine whether or not Tibetan medicine will continue to survive as a living tradition. As Tibetan medicine becomes more accessible in the U.S., it is important to realize that there is a significant difference between Tibetan medicine and the other rich information and knowledge, which the Tibetan people have already communicated to the West. The conditions under which Tibetan medicine can be practiced in this country are limited by our culture, science, economics and law. By synthesizing knowledge from various medical systems, Tibetans created an approach to medical science drawn from thousands of years of accumulated empirical knowledge and intuition about the nature of health and illness. Centuries ago, before Buddhism entered Tibet, Tibetans like all ancient people, had a significant degree of medical knowledge. According to traditional sources, in the beginning of the 4th century many new ideas regarding medicine began to enter the country. At first, influences came from India in the form of what is now called Ayurvedic medicine, as well as more spiritual and psychologically based systems from Buddhist and other sources. Around the 7th-8th centuries the Tibetan government began sponsoring conferences where doctors skilled in the medical systems of China, Persia, India and Greece presented and debated their ideas regarding health and the treatment of illness. Those with superior abilities in the diagnosis, treatment and understanding of illness were invited to stay and contribute to the country's medical knowledge base. In the 11th century, this knowledge was codified into a unique system containing a synthesis of the principles of physical and psychological medicine. imbued with a Buddhist spiritual understanding. This understanding formed a foundation for Tibetan medicine and benefited patients and doctors alike. It acknowledged how health and illness resulted both from the relationship between the mind and the body and people's interaction with the natural world and their sense of spirituality. Tibetan medicine is beginning to be promoted as a new commodity within the growing American alternative medicine industry, within some sectors of the Tibetan community and among some in the Tibet support community. 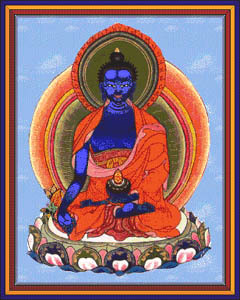 But market forces alone cannot present the true Tibetan medical tradition to the West. The Western medical tradition has already shown us the dangers of developing medicine as a commodity. In fact, the alternative medicine movement grew as a direct response by the American people to the negative impact such a development had on the quality of allopathic medical care. From the perspective of the Tibetan community there are dangers as well. The Tibetan medical community in India and Tibet has not yet developed a sophisticated understanding of the protocols and actual uses of Western medical research, the workings of Western medicine, or the American medical industry. If our goal is to preserve Tibetan medicine, we must be conscious of the powerful hegemony of our culture, and avoid to the greatest extent possible negatively affecting Tibetan culture as we attempt to encourage its preservation and perpetuation. The economy of time and commerce and the influence of Western medical approaches, places the more classical, holistic approach of Tibetan medicine at risk of being lost. Another issue of great significance is ecological sustainability. The growing demand for medicinal herbs in the West creates the potential for an ecological crisis in the countries in which these herbs grow and/or are cultivated. The burgeoning 'nutriceutical' industry is always looking for potential new herbal supplements to put on the U.S. market. "Biopiracy" is already a term commonly used in India to describe the plunder of the herbal knowledge of traditional people by pharmaceutical companies. Deforestation and over-exploitation of land in the Himalayan region is a very real crisis. In India there is a shortage of herbs required for the manufacturing of Tibetan medicines, which serve the needs of existing doctors and clinics. For these reasons, it is ill-advised to promote a sudden increase in demand for Tibetan medicine without providing for its sustainable supply and educating people to distinguish between what is authentic and what is not. If people in North America want to encourage the survival of the full tradition of Tibetan medicine and see it spread to the West, there are certain steps to take. First, we must support those institutions teaching Tibetan medicine in Asia. There are very few senior Tibetan physicians working and practicing in India, Nepal and Bhutan, and we need to insure that they can fully transfer their knowledge to a new generation. Tibetan medical education is restricted in Tibet.We must appeal to the Chinese government to allow a maintenance of the complete tradition in its land of origin. To allow a true flowering of Tibetan medical practice in the U.S., the small group of practitioners in North America who are serious long-term students of Tibetan medicine, need assistance from our Tibetan colleagues and from those Westerners who are supporters and/or consumers of this system of natural healthcare. As we succeed in our attempts to study and faithfully practice this tradition, we can begin to work with our Tibetan colleagues to build the practical and pedagogic infrastructure required for the proper practice of Tibetan medicine here. The key to Tibetan medicine's success in the U.S. will be native practitioners working in concert with American practitioners to consistently help individual patients suffering from illness. For a person to practice Tibetan medicine effectively he or she must draw upon all aspects of human cognition as well as spiritual understanding and a sense of compassion. In practice our responsibility is not only to provide for our patients. We must also serve as an example teaching our fellow citizens that living with a sense of compassion derived from ecological and spiritual awareness is the most practical way to reduce suffering in our bodies, minds, and in the world in which we live. For those who would like to see such an approach to health and medical care survive and proliferate in the West, now is the time to make it possible through thoughtful action.